Convicted murderer Henri Charriere (Steve McQueen), known as "Papillon" for his butterfly chest tattoo, is transported to French Guiana to serve his sentence in a work camp. 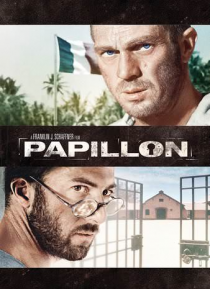 Determined to escape, Papillon forms an unlikely relationship with the frail but notorious forger Louis Dega (Dustin Hoffman), who reluctantly joins in the attempt. Despite the harshness of solitary confinement, brutal conditi… ons and constant threats of betrayal, Papillon leads a desperate escape off the island.